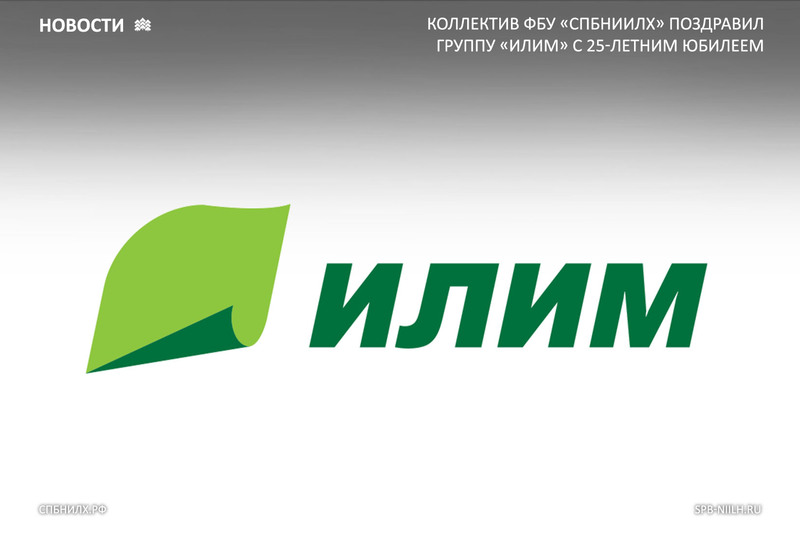 Dear colleagues, The working staff of SPbFRI congratulates you warmly on the 25th anniversary of the creation of "ILIM" Group. Efficiency and responsibility — these are the words that best describe the activities of the enterprises, members of the "ILIM" Group. Your company is not only the leader of the domestic pulp and paper industry, assuring the global competitiveness of the Russian forest industry, it also actively cares about the preserving and expansion of forest, such a valuable resource for Russia. We thank you for your cooperation and wish you further prosperity, development, and augmenting of resources — natural, scientific, technological! By the order of Ministry of Nature of the Russian Federation, the SPbFRI has developed a concept of intensive use and reproduction of forests, which was approved in 2015 at the federal level. It is based on many years of experience in the implementation of elements of the intensive model of forestry in Russia, as well as on the analysis of model application results in foreign countries. The "ILIM" group, the largest tenant of forest lands in Russia, was the first responded to the implementation of intensive model of forestry. At the moment, the concept is being implemented in the territories of several RF subjects. Due to application of model of intensive use and reproduction of forests in forest husbandry, there will be a possibility of coordinated economic, social and ecological development of the entire territory of Russia.